On the first Sunday after Christmas, there are definitely many people in church for Mass who were also there on the Sunday before Christmas. I’m sure most of you fit into that category. But, hopefully, on the very first Sunday after December 25th there are at least a few people in church for Mass (here and in other places) who were NOT there on the Sunday before December 25th—or on the Sunday before that; or on the Sunday before that; or on the Sunday before that! These are the souls who were touched by God’s grace in some way during the celebration of Christmas, and who made the decision to start practicing their Catholic faith again. Well, if you’re one of those people, I want to reinforce your decision today in and through this homily. And if you’re not one of those people—that is to say, if you’re someone who was in church last Sunday and has been faithful all along—I want to increase your level of dedication to your Catholic faith through what I say this morning on this Feast of the Holy Family. Later on we read in Luke that Mary, Jesus and Joseph traveled to Jerusalem every year to celebrate Passover, the most sacred feast in Judaism. Our Lord attended synagogue regularly—not just on the High Holy Days. They were a family of practicing Jews. And practicing their religion was good for them: it gave their lives the right center; it gave their lives meaning and direction; and it taught them how to love and serve God and one another. That, of course, was 2,000 years ago. We live in a different time, and in a different culture. But I believe the truth still applies: When you go to church and practice your religion, it makes a positive difference in your personal life and in the life of your family—especially if your religion is Catholicism (which teaches the fullness of God’s revealed truth)! And this is something that even honest secular researchers will acknowledge. If they’re researching deviant behavior, for example, and they divide people into two groups: people who practice their religion, and people who don’t, there will almost always be a huge difference in the numbers! The amount of lying, and cheating, and stealing, etc., will almost always be much greater in the “non-practicing” group. #1 When a family practices its Catholic faith, parents have another authority—the Ultimate Authority—to appeal to in dealing with their children! “Do it because I say so” can only get you so far, parents. If that’s the only weapon in your arsenal, sooner or later your children will say (or at least think), “And who are you, mom? And who are you, dad? With all due respect, you’re just an imperfect human being like me.” But if you can say, “Do it because Almighty God wants you to do it; do it because it’s HIS will”—that carries a lot more weight. 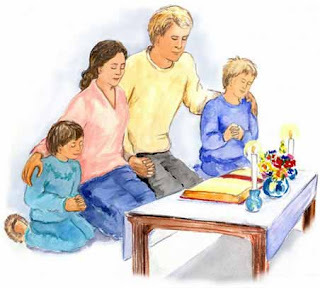 #2 When a family practices its Catholic faith, everyone learns the importance of forgiveness. And let’s face it, no family—no marriage—no friendship—no interpersonal relationship—survives for very long without forgiveness. And beyond that, practicing your Catholic faith also provides you with concrete examples of how to forgive (especially in Jesus). #3 As was the case for Jesus, Mary and Joseph, practicing your religion presents everyone in the family with the right set of priorities—the right “center,” so to speak. #4 When a family practices its Catholic faith, everyone learns to be accountable and responsible for their actions—which apparently is not a lesson that most high school students are learning these days! Did you see the results of the Josephson Institute study that came out last month? Almost 30,000 students surveyed: 64% of them had cheated on a test in the past year; 30% had stolen from a store; 42% had lied to save money—but 93% said that they were satisfied with their personal ethics and character. Not a lot of responsibility and accountability there, unfortunately. I wonder how many of them go to church every week. That’s a question they didn’t ask—but should have! And finally, #6 when a family practices its Catholic faith, every family member has the opportunity to get on—or to stay on—or to get back on—the road to heaven, which is the ultimate goal of our existence here on earth. So aren’t you glad you’re here at Mass today? You should be! Hopefully this will motivate you to come back next Sunday and every Sunday thereafter—and to practice your faith on the other six days of the week as well—for your own good, and for the good of your family. Do You Have Doubts, Or Do You Simply Have Difficulties? People will sometimes tell me that they have doubts about certain teachings of the Catholic Faith: it might concern something strictly theological, like the Trinity or the virgin birth of Jesus; or it might be about a moral matter, like the proscription against artificial contraception or in vitro fertilization. It’s normal to have difficulty understanding the Blessed Trinity; it’s normal to have difficulty grasping how God became man in Christ Jesus; it’s even normal to have difficulty understanding the reasons behind some of the Church’s moral teachings. But all those difficulties put together and multiplied by 10,000 do not add up to one single doubt! 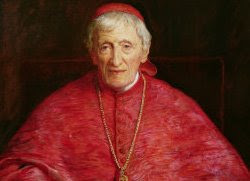 As Cardinal Newman indicates in that line I quoted a few moments ago, difficulties and doubts are qualitatively different things! This is something that many sincere believers do not seem to realize; hence they confuse the two realities. They ponder and wonder and question, and they think they’re having doubts, when in actuality they’re simply experiencing ‘difficulties’—some of which even the great saints experienced! But that’s not true. Mary didn’t doubt: not for one single second! However she did experience a number of difficulties that she initially couldn’t make sense of. Yes, she was; and to us it makes perfect sense. But people who are truly holy don’t think they’re special! They think they’re ordinary, because they’re so humble. And Mary, because she was sinless, was even more humble than all the other great saints of Church history! So her reaction was completely understandable. It was a difficulty, not a doubt. But once again, we’re in the realm of ‘difficulty,’ not doubt. This verse is one of the clearest indications in Scripture that Mary was ALWAYS a virgin, even after the birth of Jesus. Many Protestants, of course, don’t believe that. They believe Mary was a virgin up until the time of our Lord’s birth, but that she and Joseph lived a normal married life afterward. However, if the Protestant position is true, then Mary’s question makes no sense! If Mary intended on living a normal conjugal life with Joseph, why would she have asked a question about how the conception of the Savior would occur? We have no reason to think that Mary was ignorant of the basic principles of biology! The way the question is phrased indicates that Mary and Joseph intended to refrain from relations during their entire marriage, which supports the Catholic teaching that Mary’s virginity was perpetual, not temporary. And so, once again, we’re dealing with a difficulty, not a doubt! Based on the vow she had made to the Lord to be continent even after her marriage, Mary had difficulty understanding how she was going to get pregnant and have a child. Mary needed the help of Gabriel to deal with the difficulties she experienced at the Annunciation. At times we also need help dealing with ours. Do we seek that help and deal with our difficulties quickly and effectively? Or do we just sit back and let them multiply? Ten thousand difficulties do not make a doubt—that’s true; but even a few difficulties can lead to doubt if they’re never addressed. Just ask your ex-Catholic friends who are now Jehovah’s Witnesses or evangelical Protestants or Scientologists—or atheists! Obviously, they all had difficulties with the Catholic faith that were never addressed in a satisfactory way; consequently, they ended up embracing another religion—or rejecting religion entirely. This is one of the reasons why I have my youth group for teenagers every Thursday night. I want them to have a place where they can come to deal with the spiritual and moral ‘difficulties’ they have as young people. 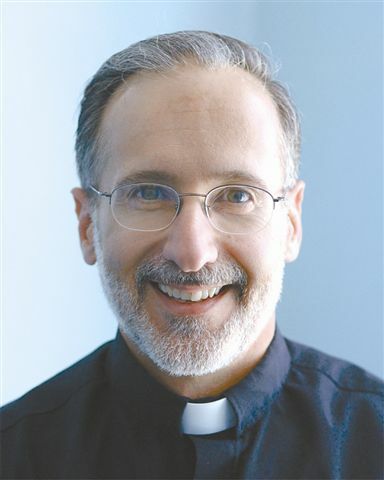 My pastor, Fr. Pat Rotondi, helped me address my difficulties when I was a teen (a few years ago), and I know what a positive difference that made in my young life. At a crucial time in my development, it helped me keep my head on straight (more or less!). The bottom line is this: None of us can avoid difficulties! (In a sense, that’s the bad news.) Everyone with faith experiences them; even our Blessed Mother did. But the good news is that even if our personal difficulties are serious and challenging and numerous, we can always avoid doubts—if we want to. What words would you use to describe Mary? What words would you use to describe the Blessed Mother? Holy?—that’s probably the first one most people would think of. Other possibilities might be: favored, sinless, unique, loving, selfless, immaculate, pure, chaste, faithful, and humble. I’m sure you could come up with many others. But here’s one that the vast majority of Catholics probably would not think of immediately—although I would say it should be near the very top of the list: CONSISTENT! Mary, our Blessed Mother, was consistent. And, believe it or not, this was at the root of her greatness! 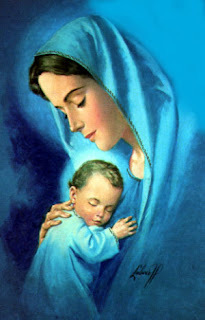 We say that Mary was the greatest human person to ever walk the face of this earth. And she was great because of her consistency. Which really shouldn’t surprise anyone, because even for the rest of us, greatness and consistency are intimately connected. A great athlete, for example, is someone who plays well consistently. Many of the golfers on the PGA tour are able to hit shots just as proficiently as Tiger Woods does. But Woods hits a lot more of them! And that’s the difference! He’s far more consistent than all the others, and that’s what makes him the greatest golfer in the world right now. A great student is someone who applies himself to his studies and consistently gets good grades. He might get a bad mark now and again, but for the most part he gets A’s and B’s. A great businessman is someone who consistently makes good deals: deals that earn him a profit. His business prospers, while others go bankrupt. Mary was consistent in the most important matters of life. She was consistent, first of all, in her yes to God. “Be it done unto me according to your word,” wasn’t something she said to the Lord in one isolated moment of time (at the Annunciation). It was something she said to God—at least implicitly—in every situation and circumstance of her life. She was consistent in her charity (we see this in the story of the wedding at Cana, when she intervened to save the newlyweds from embarrassment and disgrace); she was consistent in her selflessness (we see this at the Visitation, when she went to help her pregnant cousin Elizabeth, even though she herself was pregnant with Jesus); she was consistent in her chastity, in her purity, in her faithfulness. All the great saints of the Church, of course, were consistent in these very same ways (at least they were AFTER their conversions!). But Mary was unique among them in that she was PERFECTLY CONSISTENT! Mary was like a golfer who never made a bad shot; she was like a student who never got anything less than a 100 on a test; she was like a businesswoman who never made even one bad, unprofitable deal in her entire career! Concupiscence is what’s wrong with the rest us. Concupiscence is the problem. Concupiscence is what makes the rest of us something less than perfectly consistent. Oh yes, believe! It can happen that quickly. That happened because concupiscence was still at work in St. Paul—even after he was converted by Jesus on the road to Damascus. It was not at work in our Blessed Mother. Holy Mary, Mother of God, pray for us on this feast of your Immaculate Conception, that we will receive the grace we need to be more consistent in our lives: more consistent in our faithfulness to God, more consistent in our charity, more consistent in our purity and holiness, more consistent in saying yes to virtue and no to vice. On this side of the grave, we know that we will never be perfectly consistent in the way that you were; but deep down inside we all know that we can be a lot better than we currently are. And we believe we will be better, with the help of your powerful prayers. Amen. Almost everyone this time of year is looking for a bargain—a good deal—a pre-Christmas sale that might help them keep more of their hard-earned cash. Two-for-one sales are great (if you can find them! ); three-for-one deals are even better—especially this year, in the midst of the current economic crisis. 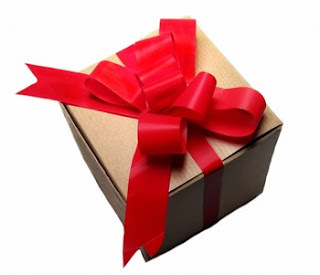 Well, today I offer you a gift that will cost you absolutely, positively nothing, financially speaking. You can’t get any better than that! If you receive it, your wallet or your purse will not lighten up at all—not by one single ounce—although you might feel a little bit “lighter” on the inside. Some of your fellow parishioners have already made this ‘deal’—and I dare say everyone who has is glad that they did. Now it does cost something—and admittedly for some the price is too high—but everyone can afford it, even those on a fixed income, even those who live below the poverty level. To receive this gift, the price you’ll need to pay is completely internal, and it starts with two things: humility and honesty. If you’re not willing to be humble, and if you’re not willing to face your true self with an honest heart, the gift is way beyond your reach—even if you’re the richest person on earth! But humility and honesty, although necessary, are not sufficient. You’ll also need a healthy dose of contrition, as well as a commitment to try to be better. By now I suppose that most of you have figured out what this gift is: Forgiveness! Reconciliation with God! I knew what he meant, of course; but what he was actually asking for was an Advent gift from Jesus Christ: a gift made possible by the sacrifice of our Lord on the Cross. So a few days later he came to see me with all the necessary prerequisites: humility, honesty, contrition, and a commitment to try to be better (what we usually call “a firm purpose of amendment”), and the Lord happily gave him the gift he desired. Free of any monetary charge! Our Scripture readings today are like 3 commercials for this most important gift from Jesus Christ. (That’s one way to look at them, anyway.) Our first reading is a messianic prophecy from Isaiah, chapter 40—a passage that we believe was fulfilled in the ministry of John the Baptist. John, as we all know, preached a very clear and a very strong message of repentance, in trying to prepare people for the coming of their Messiah. Repentance is what makes the Lord’s path into a person’s heart ‘straight’. That’s why it’s so important; that’s why it’s essential! As long as we have life in our body, the Lord’s patience—thankfully—remains. But it’s never a good idea to delay repentance, since no one of us knows when our life will come to an end. I’ve included an examination of conscience in the bulletin today. I highly encourage you to look it over, take an honest inventory of your life, and make a good confession sometime within the next two weeks. To make it easy for you, both Fr. Giudice and I will be hearing confessions in this church for two hours next Saturday and the Saturday after (from 2:30-4:30pm). If you do this (and I hope you do), I can promise you two things: Number 1, neither Fr. Giudice nor I will yell at you—even if you’ve been away from the sacrament of Reconciliation for many years. And number 2, this will be the best—and the most important—‘deal’ you make this December. In exchange for humility, honesty, contrition, and a firm purpose of amendment, you will receive the most valuable gift in the universe—the gift you MUST receive to get into the kingdom of heaven. And it won’t cost you a single penny.